Android usage in India is growing compared to iOS with the fact that iOS devices expensive in India compared to US. With the launch of cheap smartphones equipped with Android will increase the number of smartphone users in India to a whole new level. Nielsen Informate Panel did a study of android app users in India and updated the results in a blogpost. According to the report Indian users spend 40 percent of active time on data centric apps on their smartphones. 25 percent of the total time they spend on Android apps developed by Google itself and 75 percent time they spend on other apps. Although Google apps dominate the user time on android smartphone, the most popular app on android doesn’t belong to Google. The top spot is taken by Facebook in social networking category. 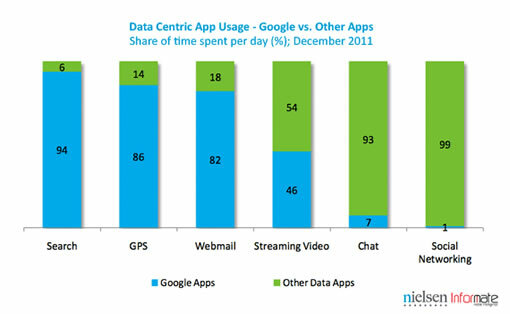 Google apps dominate in five out of seven app categories and Nimbuzz app tops the chat category. In Google Apps Android Market, YouTube, Gmail lead app usage followed by Gtalk, Google Maps and Search. 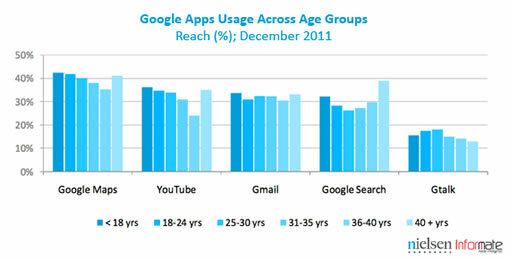 The study states that Google apps have fairly uniform usage across age groups.